Onyx went missing on Saturday, August 29th when she pulled away from the owner while on a walk. She took off with her leash still attached. She made it over 5 miles to Sheatown where she was safely trapped today September 2nd. 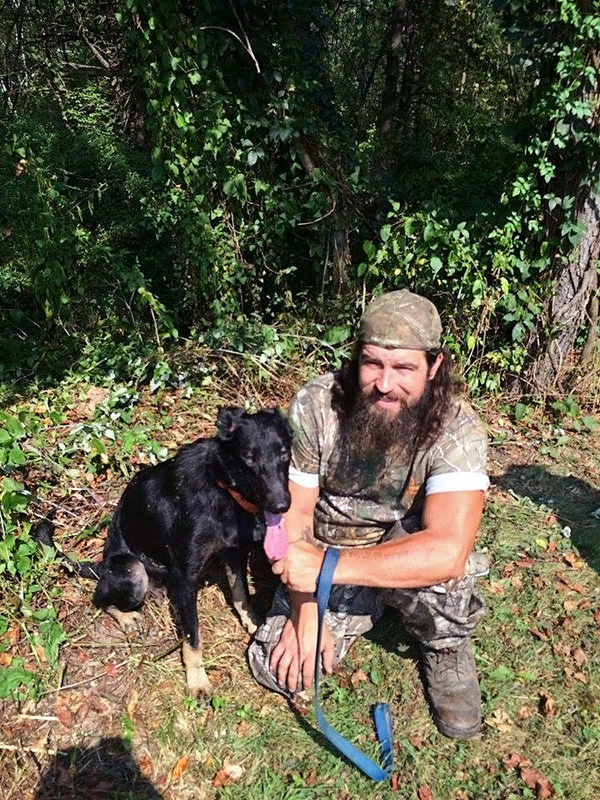 We had a sighting by the owner yesterday deep in the woods and of course Onyx ran like most lost dogs do. Yesterday I asked the owner to take me to where he saw Onyx in the woods. It was way too far into the woods and not a good spot to trap and way too much quad activity back there. So, I asked the owner to show me the other area she was seen in to see if that was a better spot. As soon as we got there, it was a much better spot and an area where we could lure her out of the woods and not have to go into the woods and scare her. I knocked on the door of the house close to where she was seen and asked for permission to search the woods behind their house. Not even 5 minutes after looking, Onyx appeared and looked right at us and headed towards us. But, then she turned and went over and walked past my car and then sniffed the owner’s car and headed back into the woods. We quickly setup the trap and prepared for a very long night. We checked the trap every 2 hours and nothing. Around 5 am I headed up to check the trap again and no sign of her, I refreshed the food and headed back out to work. She was seen in that area around 10:30 the day before and I had a good feeling she would be making another appearance there today around the same time and sure enough she did!!! The trap was checked around 10 am and no Onyx. But, then the homeowner called me where I had the trap set before 11 am and said I swear I just heard a dog bark in the woods. I told her it was most likely her and asked if she would be so kind to take a walk out to the front of her home to check. She graciously did and sure enough I heard Onyx barking as she was walking towards the trap and she said….”she is in the trap!! !” Words I live for… smile emoticon I called the owners Dave and Sabrina and they were thrilled!!! Onyx has lost weight, has some scraps/cuts, is full of burrs (those buggers hurt I was covered in them last night) and most likely ticks. She will be seeing the vet for treatment. Onyx looked rough last night because of the heat and was exhausted and probably dehydrated. Thankfully, those are all things that can be treated and fixed though. I would like to thank the homeowner’s that graciously without a second thought allowed me to search their yard and called me to tell me they heard her barking (I’m sorry I didn’t get your names). Thank you to the owners Dave and Sabrina for trusting me to get their baby back, it is a long and sometimes strange process to people that have never experienced a lost dog before….thanks for sticking with me and believing in the methods to my madness. Welcome home sweet Onyx, you are safe now….no more running. Onyx and her owner Dave right after they were reunited.